To make reading this blog post as awesome as possible, I highly recommend listening to Pink Floyd’s ‘Time’ in another browser window by clicking this link. 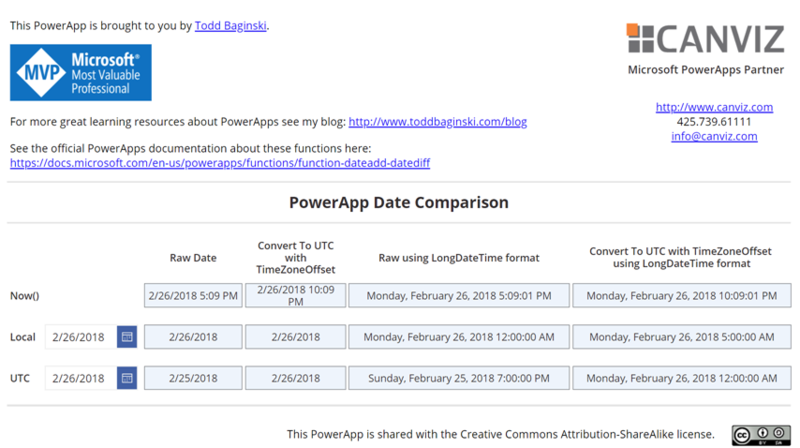 Alright, enough joking around, here are a couple of things related to Dates and Times to be aware of in PowerApps. First, in case you never noticed, the Date Picker control in PowerApps allows you to set the Date time zone property. Depending which value you select, the date and time returned by the control will reflect the Local or UTC date and time. Pay attention to this and make sure you set the property to meet your scenario. Another thing to be aware of, the connectors that communicate with the Graph API (or any other API), or custom connectors you create, may return Local or UTC times, and they may also expect Local or UTC times as parameters. Here’s an example of a date and time value coming back from the Graph API. When you are developing PowerApps, you need to make sure you are always using the appropriate Local or UTC times to ensure all your data makes sense in the PowerApp as well as all the systems it integrates with. You may also need to convert Local dates and times to UTC dates and times. It all depends on your PowerApp and the connectors it uses. To make this easier to figure out I created a sample PowerApp that demonstrates how Local and UTC Date Pickers work and also how to use the TimeZoneOffset function to convert Local to UTC time. You can also convert UTC to Local time pretty easily, but it’s not demonstrated in the sample PowerApp. You can learn how to do that here. Download the sample PowerApp here. Thanks, Ian Davis, for working through this with me. Great post as it high lights some of the simple things that might trip up someone who is just starting out with PowerApps.